“A cornucopia of the Mid-South’s finest produce was shaping up in Memphis yesterday,” reported the Commercial Appeal on September 12th, 1957. “From it a bountiful supply of choice products of garden, field and stream will pour today and tomorrow as 55 outstanding farmers of Arkansas, Mississippi, and Tennessee offer blue ribbon fruits, vegetables, and other delicacies in an unusual sale. 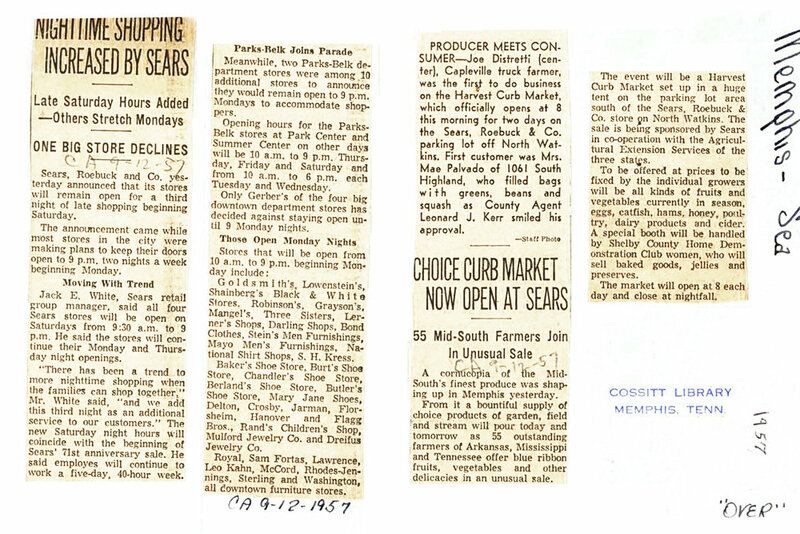 A precursor to the ubiquitous farmers’ markets of today, this “unusual sale” was dubbed the Harvest Curb Market, a weekend long affair held in the parking lot of Sears Crosstown. It held the name “Harvest” as differentiator from a better known market just south of the Sears building, which had been open since 1937, which locals simply called the Curb Market. Located in Crosstown on North Cleveland where Kroger stands today, the Curb Market offered fresh produce, garden and florist shops, as well as a meat market and restaurant. It was where most Sears employees would venture for lunch and workday shopping, due to its variety and proximity. Memories like these are held by generations of Memphians who frequented the Curb Market in Crosstown. And now, nearly 30 years after it was shuttered, a new Curb Market will be opening in Crosstown Concourse, one that echoes its predecessor not only in name and convenience, but in the simple idea of neighbors providing food to neighbors. Articles from the Commercial Appeal on September 12th, 1957 about the Curb Market. Tennessee businessman and farmer Peter Schutt, owner of Winchester Farms in Dancyville, TN and the recently opened Curb Market on Cooper, explains why he decided to bring Curb Market back to Crosstown. “I remember my mother taking me to the original Curb Market in the 1950s. This whole project is an outgrowth of great childhood memories,” says Schutt. "My wife and I have been operating Winchester Farm in Dancyville as a chemical-free livestock farm for more than 10 years. We have one of the largest Angus herds in the area, and we also raise heritage hogs,” Schutt says. “In 2015, we began a certified organic produce farm in nearby Whiteville. But like many local growers, it was always difficult to market what we produce, other than once or twice a week at farmers’ markets. None of the big box supermarkets were interested in buying from us. So what better way to get local food to local customers than by having our own store." At 8,500 square feet, The Curb Crosstown will be four times larger than its sister location and will offer a wider array of locally sourced produce and dairy, as well as a larger selection of healthy, organic groceries and frozen foods. It will include a butcher shop, so customers can purchase fresh cuts of beef, poultry, and pork— even sausages made in-house. “We also will have a selection of wines and beers for our customers,” Schutt adds. Reviving the Curb Market in Crosstown nearly 80 years after its original arrival was not just a serendipitous occurrence according to Schutt. “Of course, the original Curb Market was practically next door to the Crosstown Concourse on N. Cleveland, so it makes sense to return to its roots. But that wouldn't be feasible without the resurrection of the Concourse and more particularly the strong presence of Church Health there,” Schutt said. The market’s arrival at Concourse brings the nearly 60-year-old words of the Commercial Appeal to life again— The Curb Crosstown will be “a cornucopia of the Mid-South’s finest.” Indeed it will.